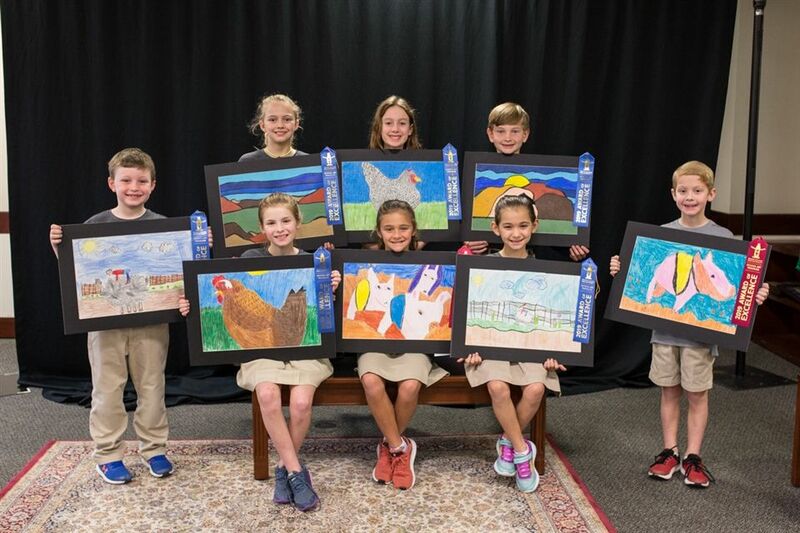 Each year, the Houston Livestock Show and Rodeo hosts an art contest for Houston area students. In the fall, the HLSR hosts an information session about the rules for the art contest. They emphasize that the artwork should reflect Western landscapes and traditions and explain the regulations about mediums, sources, and dimensions. This year our students in lower, middle and upper school created art using several types of mediums from colored pencil, pen, chalk pastel, oil pastel to watercolor, chalk and oil-based paint. In upper school, art teacher Nora Ripple ’02 inspired her students by showing them photos of cactus, livestock and landscapes. Art II students drew larger than life tools using charcoal to create their pieces. AP students made abstracted watercolor and colored pencil works showcasing cacti and Honor art students focused on skulls using the medium of their choice. The ribbon scoring system is as follows: first place receives a blue ribbon, second place receives a red ribbon and third place receives a white ribbon. A total of 29 ribbons were awarded to our lower, middle and upper school art students this year. Congratulations to the SBS Arts Department! Click here to view the award-winning artwork. Or, stop by the Woliver-Anderson Library on the sixth floor where our students' art is on display for the next few weeks.